Immaculate Tumwebaze is one of the 18 members of Katara Women Poverty Eradication Group (KWPEG) that benefited from the Scaling-up rural electrification using innovative solar PV distribution models project implemented by WWF with funding from EU. This is her story. The mother of six says she does not regret the decision she took to get a loan from the saving scheme and pay for the solar since it has served her needs. Early November 2017, Tumwebaze acquired the solar from KIIMA FOODS, a project coordinating hub for the southern Albertine Graben with about eight districts. With the provision of paying in installments, she started with Shs 100,000 which is the 20 per cent of the total cost of the solar product. Tumwebaze has been paying about Shs 50,000 monthly, and is hopeful that she will finish her payments by the end of November 2018. “I had for the last nine years used the Kerosene lamps to provide light both at home and at the shop…this took a lot of money and even the light was not bright,” Tumwebaze narrates. 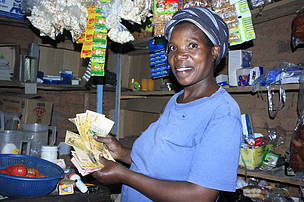 She used to buy paraffin from Nyakasharu or Ndekye trading Centres which are about 10 kilometers away from her shop, adding that she would use paraffin of Shs 1,000 a day and transport of Shs 4,000 weekly. She adds that the kerosene lamps had put her health at risk since she would inhale intoxicated fumes from the lamp and the same fumes would also dirten everything in her house. “I also used to fear that at one time the kerosene lamp would cause fire that would burn my shop as it has ever happened to other people here,” she adds. But on top of all the other challenges of using a kerosene lamp, Tumwebaze also notes that the it would never provide a bright flame, something that thieves would see as a chance to steal items from her shop. “You know some of these customers are thieves. They would point at some product and when I turn to pick it, I find they have already stolen some other thing. This is no longer there. I have enough light,” Tumwebaze says. Additionally, Tumwebaze notes that with solar electricity now, she is able to charge her phone and cut on the expenses she used to incur when charging from other people’s homes that were also distant. Tumwebaze is hopeful that her son Monday Joseph who sat for his Primary Leaving Exams (UPE) this year will pass with flying colors since he utilized the light for his evening and morning revisions.